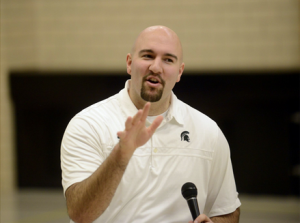 Anthony Ianni will be the guest speaker at the NIU Graduate Colloquium, May 4. Anthony Ianni, the first-known athlete with autism to play Division 1 college basketball, will be the speaker at the Graduate Colloquium, 3:30 p.m., May 4, at the Capitol Room of the Holmes Student Center. Ianni, of the Michigan Department of Civil Rights, is one of the most sought-after motivational speakers in the region. At age 4 he was diagnosed with Pervasive Developmental Disorder (PDD), a disorder on the autism spectrum. His parents were told he would probably not graduate high school and would likely have to live in a group home. But with his family’s support, he overcame bullying, adversity and personal challenges. He earned a bachelor’s degree in sociology from Michigan State University, where he also played basketball, winning two Big Ten Championships. At 26 he has only just begun. He has been invited to tell his story and share his message across the country, inspiring many to LYD, Live Your Dreams. For more information about the Graduate Colloquium, please email chhsevents@niu.edu.